TORREBARRIO, Spain (VN) — Chris Froome was there, then he was gone, then he fought back, then he faded. Saturday’s thrilling duel up Ancares pretty much summed up the Vuelta a España so far for last year’s runner-up. After he finished second overall at the Tour de France this year and at the Vuelta last year, many expected Froome to cause the most trouble for Alberto Contador. So far, he has struggled to find that same spark that lit up his legs in July. After ceding more time Saturday to Contador and race leader Joaquim Rodríguez (Katusha), Froome remained in third place, but slipped to 1:41 back. Though frustrated, Froome continues to fight for all his worth, but he’s losing ground when he needs to be taking time if he is to win the Vuelta when it ends September 9 in Madrid. 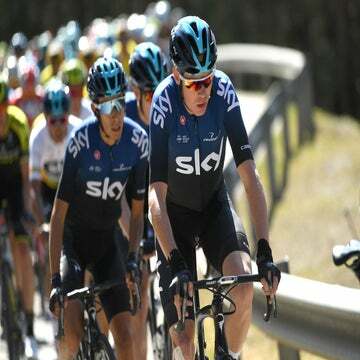 Froome seemed against the ropes, but dug deep to regain contact with Alejandro Valverde (Movistar) and Rodríguez with about 1.5km to go. Just as he was closing in on Contador, Froome tried to attack, but went into the red and couldn’t respond when Rodríguez countered to eventually catch Contador and win the stage. Froome was hoping to take back some time on Rodríguez, but instead lost time to all of his major GC rivals. Now tied for third with Valverde, Froome will have a hard time finishing on the podium if the three Spanish riders continue to attack. He also said the Vuelta is raced differently than the Tour, saying the Spanish tour is more explosive than the more-controlled French race.